First Berkshire Fleet List: 41165 has received brown Overground branding for route 41/43. Thanks to Stephen Le Bras for this. First Berkshire Fleet List: 46923/5 have been withdrawn from Slough following the entry into service of 64020/1 in May. The exact date of withdrawal is not clear. 46927 has been withdrawn following the arrival of 41171 and 41173 replaces 46196 that was withdrawn in February. The rest of the Marshall Darts will replace 46079/81/82/83/195/197/198. Thanks to Matt Wooll for this. Reading Optare Deltas: 501 and 502 also now have new destination displays fitted, just leaving 506 unconfirmed. Thanks to Pete Baggett for this. Stagecoach in Oxfordshire & Warwickshire Fleet List: 52436, 52447, 52451 and two others are withdrawn and in store at Nuneaton. Thanks to Keith Wood for this. The former London Olympians are being fitted with new LED displays in place of their roller blinds, with at least two already fitted. Stagecoach in Oxfordshire & Warwickshire Former Vehicle Fleet List: 50036 and 50039 are two another for Motorvator and 50042 for Megabus, leaving 50037 (possibly for Megabus) and 50049 the only ones unaccounted for, plus fire damaged 50040. Reading Transport MegaRears: The Sunsilk MegaRears previously applied to 924/5 were removed during October 2003, not November as previously reported. Thanks to Brian Coney for this. First Berkshire Fleet List: Arrival date for 41170 corrected to 10-2003 from 11-2003. 41170 was repainted into First corporate livery during July 2004. 64812/3/5/6 had MegaRears for Go Shopping @ Bracknell applied in November 2003 and 64819 had one for Reading 107FM applied in December. Thanks to Brian Coney for this. It's believed that only the rears on 64813/5 survive. Courtney Coaches Fleet List: D898 YCF was withdrawn for scrap during February 2003. Extra details about some of the former vehicles listed added. Thanks to Brian Coney for this. Horseman Coaches Fleet List: M653 SBL was sold to Tilehurst Mini Coaches in December 2003. Thanks to Brian Coney for this. Weavaway Travel Fleet List: X501 AHE and R7 BRD were withdrawn and sold in September 2003, C454 GKE in October 2003, and L549/52 EHD in November 2003. 327 RFC was reregistered P504 LMO in October 2003. L549 EHD carried plate B10 MBT between September and November 2003. Thanks to Brian Coney for this. Stagecoach in Oxfordshire & Warwickshire Former Vehicle Fleet List: 50034, 50038 and 50060 are more now at Glasgow in X77 branded corporate livery, and 50054 is another now with Motorvator. First Berkshire Fleet List: 41170 entered service at Slough from Bracknell on 27th August, 68502 returned from loan elsewhere on 1st September and the two new BMCs are allocated to Chertsey and entered service on 22nd September. Thanks the Matthew Wooll for this. Reading Optare Deltas: 503, 504, 505, 508, 509 and 510 also now have new destination displays fitted. Thanks to Pete Baggett for this. First Berkshire Fleet List: New at Bracknell from 21st are BMC school buses RX54 AOY/V, no fleet numbers are known as yet. 41166/8/9 have arrived from London and are being prepared for service, 41166/8 arriving on 19th and 41169 on 17th. Thanks to Matthew Wooll for this. Reading Transport Fleet List: Fire damaged 512 has now re-entered service with its back window panelled over. Thanks to Steve Wickens for this. Reading Optare Deltas: 504 and 507 have received Hanover LED displays. Thanks to Pete Baggett for this. Stagecoach in Oxfordshire & Warwickshire Fleet List: New at Nuneaton are 34626-8 registered KX54 OPA-C to enter service on route 48 at the start of November. 31333 has transferred from Nuneaton to Leamington (having been made free by the early entry into service of 34625), and Leamington 40140 has been withdrawn. 52308 has transferred from Rugby to Leamington. 52434-39/44/47/50/51 are to transfer to Northampton when the newly transferred coaches actually enter service at Rugby. 20557 is now refurbished whilst 20559 is now away for the work. Reading Transport Fleet List: 112 returned from loan to Newbury on 17th. Thanks to Brian Coney for this. Stagecoach in Oxfordshire & Warwickshire Fleet List: 14935/7 were rapidly transferred to Stagecoach East following a fire at Biggleswade outstation, but otherwise would have gone on loan to Oxford. 16518/9 are now confirmed as in temporary use at Oxford pending new Tridents later in the year, which will free the Volvos to move to Leamington to help replace 16598-600. 16525 is now at Banbury, whilst 16524 lost its MegaRear for Smollensky's and 16526 its MegaRear for Bosch upon recent repaints. 16615 seems to have returned from its loan to London (Leyton) some weeks ago, and 29108 returned from its loan to Cambridge a few weeks back after the planned month. 40162 has moved into reserve from Banbury following the loss of route 499. Stagecoach in Oxfordshire & Warwickshire Fleet List: To correct the report from 17th, withdrawn 14935/7 are not yet confirmed as sold, and seem to have disappeared from Oxford again. Reading Transport Fleet List: 112 has gone on loan to Newbury (from 15th) to cover for 117 which broke down in the Reading area. Thanks to Brian Coney for this. 801 is registered YN54 AEP. Thanks to Jon Nutt for this. Stagecoach in Oxfordshire & Warwickshire Fleet List: Withdrawn 14935/7 arrived at Oxford today, and look likely to see a couple of weeks use on start of term Brookes Bus duplicates before moving on to their new homes. Stagecoach in Oxfordshire & Warwickshire Former Vehicle Fleet List: 40137/9 have transferred to Stagecoach in Northampton, not Stagecoach Scotland as previously shown. Thanks to Nigel Diplock for this. Weavaway Travel Fleet List: The two Optare Solos have been named Pugh 1 and Pugh 2, presumably in alphabetical order. Thanks to Pete Baggett, Jon Nutt and Derek Bradfield for this. Reading Transport Fleet List: New Scania OmniDekka 801 arrived in Reading last Saturday, whilst 973 has gone away for an engine modification. The first four Scanias will commence type training before the whole fleet of 17 vehicles launches on 25th October. 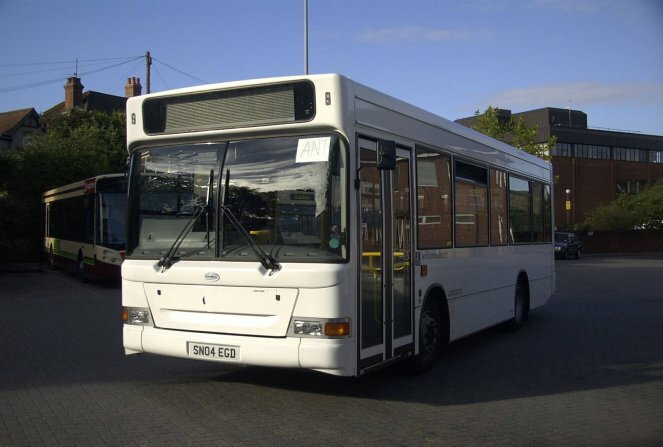 Reading Transport Former Vehicle Fleet List: Mini Pointer Dart SN04 EGD is on short term loan at Newbury to cover for 973. Thanks to Brian Coney for this. Weavaway Travel Fleet List: B10 MDC has been repainted into a new yellow livery with Noah Vale fleetnames and named Ark Royal. Thanks to Jon Nutt for this. Derek Bradfield reports that at least two more (not B10 MBD/MKF though) have also been rubbed down in preparation for this new livery. Stagecoach in Oxfordshire & Warwickshire Fleet List: Expected at Rugby are 52645/47-49/54 and 53011/22 to replace 52434-39/44/47/50-51 all in National Express livery. 52645/48/49, 53011/22 arrived from Mansfield on 13th with 52647 expected from Perth and 52654 from Dover later this month. Thanks to John Hammond for this. First Berkshire Fleet List: 42644 has now transferred from Slough to Bracknell, and 41133 has also entered service at Bracknell. 42373 has lost its MegaPanel advert for East Berkshire College. The new fleet number for 228 is corrected to 46928 and 625 corrected to 62625. Thanks to Stephen Le-Bras for this. Stagecoach in Oxfordshire & Warwickshire Fleet List: 50034 and 50038 were withdrawn sometime at the beginning of September. Stagecoach in Oxfordshire & Warwickshire Former Vehicle Fleet List: 50035, 50041, 50045, 50056 and 50059 are five more that are being used on the Motorvator service in Scotland, whilst 50044 is for service X77 rather than Motorvator as previously reported. 50034/36/38/39/42/43/49/52/54/60 and fire damaged 50040 have yet to be reported elsewhere. First Berkshire Fleet List: 41170 moved from Bracknell to Slough on 31st August, entering service on 7th September. 41167 transferred from London to Slough on 31st August for preparation before entering service. 68502 has returned from demonstration elsewhere in the country, again on 31st August. Thanks to Mac Head for this. Courtney Coaches Fleet List: New arrival 4754 RU is in fact a Leyland Olympian / East Lancs, former reg A487 HKB and as such is probably not one of the four Volvos that are expected shortly! Thanks to Derek Bradfield for this. After this false start, the first Volvo Olympian has now arrived, registered S848 DGX and painted in undercoat grey. Thanks to Ian Milhell for this. First Berkshire Fleet List: 41170 moved from Bracknell to Slough last week. Thanks to Matthew Wooll for this. Courtney Coaches Fleet List: The first of the Volvo Olympians is registered 4754 RU. Thanks to Derek Bradfield for this. Courtney Coaches Fleet List: New acquisitions are Dennis Javelin / Wadham Stringer K155/9 EJB from former operator Nightingale of Maidenhead. H859 PTW has been withdrawn and sold to an operator in Essex, whilst four exLondon Volvo Olympian / East Lancs are due. Thanks to Ian Milhell and Derek Bradfield for this. First Berkshire Fleet List: 240 (X246 AMO) new fleet number corrected on list to 42346, not 42340, and 250 (T375 NUA) corrected to 40721, not 42675 as would be expected. Former Ivecos 249 and 269 were also being shown erroneously, and never had the new fleet numbers that the list was showing allocated. Thanks to Mac Head for pointing these out. Stagecoach in Oxfordshire & Warwickshire Fleet List: Banbury's 14936 has been sold along with Rugby's 14930/1 and Leamington's 14933, and is to be replaced by 16525. 16519 (currently in use at Banbury and Witney) will move to Oxford. 16518 has been in store at Leamington and is to return to service at Oxford for a period. 16524 lost its Job Centre Plus MegaRear a few months back in favour of one for Smollensky's. 16514-22/5-6 have received a full repaint in the last few weeks, only 16523/4 remain to be done as time allows, although all will soon be required in service once again as the students return to University. Presumably 16526 has lost its Bosch MegaRear?